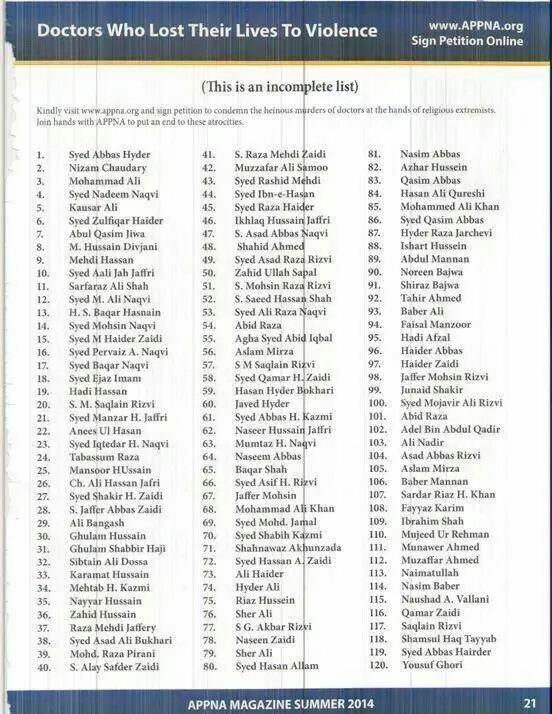 According to LUBP database, at least 18 Shia Muslim doctors have been target killed by Deobandi ASWJ terrorists in Pakistan betwen 1 Jan 2014 and 10 Jan 2015. Total number of Shia doctors target killed in last few years is estimated to be more than 300. On 10 Jan 2015, three Shia doctors were target killed across Pakistan within a few hours by Deobandi ASWJ terrorists. Two Shia doctors Syed Ali Akbar and Syed Yawar Zaidi were target killed (10 Jan 2015) in separate attacks within a few minutes time in the Paposh Nagar and Nazimabad area of Karachi. Earlier on the same day, 10 January 2015, another Shia doctor Syed Asim Tirmizi was target killed by Deobandi ASWJ terrorists in Hayatabad area of Peshawar. 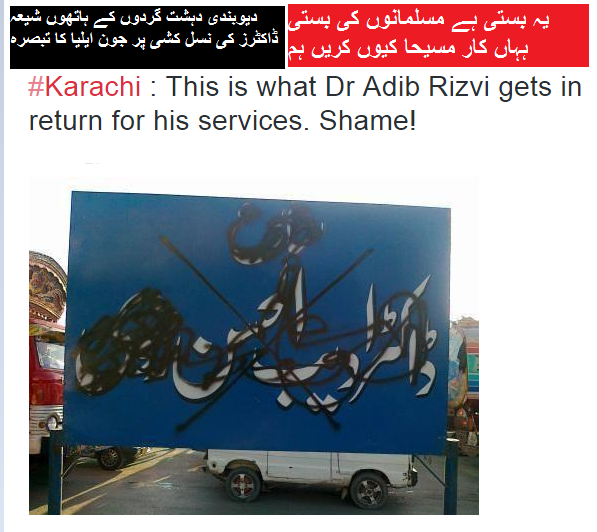 On 1 January 2015, Dr Ahsan Ali was target killed by Deobandi terrorists in Karachi. On 22 Oct 2014, Dr Haider Raza and another Shia doctor were target killed in Karachi. In a few instances, Sunni and Ahmadi doctors too have been target killed by Deobandi terrorists due to misidentification by Shia-sounding names. As expected, Pakistan’s elitist (fake) liberals remain tight lippped on or continue to obfuscate Shia genocide by Deobandi ASWJ terrorists. Govt of Pakistan should start operation against these terrorists.